Say you do everything right with your pool when it comes to proper pool care. Your water looks great, your pool is sparkling, but one morning you wake up and inhale to a strong smell of chlorine. You think back, did you shock your water too much? But that’s not it. Why does your pool smell so strongly? Well, in actuality, an overwhelming smell of chlorine is actually an indicator of the presence of the organic compound called chloramine. This compound forms when the chlorine in your pool combines with nitrogen or ammonia (both items that are supplied by swimmers’ body waste and other organics in the water). Chloramines are always present but are only an issue when they achieve elevated levels. Other ways to know that your pool chemistry is off include red eyes or skin irritation from swimmers. It is important to fix this situation and prevent bather discomfort. Unlike chlorine, chloramines do not evaporate in the sun so different solutions must be employed in a timely fashion. To eliminate chloramines, treat your water with a heavy dose of chlorine, enough to raise levels to 5-10 ppm for at least four hours (regularly called “SHOCKING” the pool). If this does not change the chlorine/ammonia ratio to 7.6 to 1, then it will incidentally create more chloramines. If it works, the shock of chlorine will disconnect the chlorine molecules and sanitize your water (and reduce the unwanted smell). 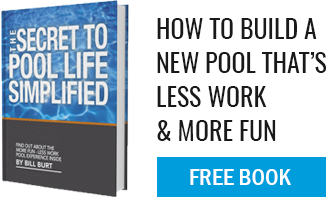 Shocking a pool should be a regular part of pool maintenance so as to avoid buildup of the chlormines. Before you start on either of these treatment methods, it is important to talk to a pool professional about what you should do. At Aqua Pool, we are here to guide you!